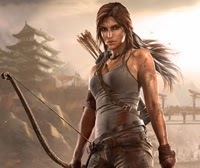 Recently released on the PS4, does Tomb Raider transfer over to the PS Vita remote play all right with all its graphical upgrades?…. As a re-release onto a next-gen system, Metacritic has scored this an 84 already. I've played through a bunch already and have been impressed with the beautiful graphics, spot on controls on the DS4, the leveling up system, and interesting story line. Some of the complaints on Metacritic have been the negatives about a re-release, or the quick time events. Kudos go out to all DLC included in this version, great framerate and graphics, and if you never have played the 2013 version (like me) then this IS the definitive version. On to the Remote Play Review! I started to play the game on the PS4 (I always like the big screen more than on my Vita so far with Remote Play. I need my glasses for that one to see all the details/words/etc.). Within 15 minutes there's an interactive scene to scramble up a slope by alternating L2/R2 and some voice commands to open the map screen. How would that transfer over to Remote Play on my Vita? I tried it to see. When you fire up the Vita, you can access the "controls menu" to see the button mapping scheme. I still like how Assassin's Creed automatically calls up the Remote Play button scheme as soon as you turn on Remote Play without having to select it, so I always compare my reviews to that excellence. 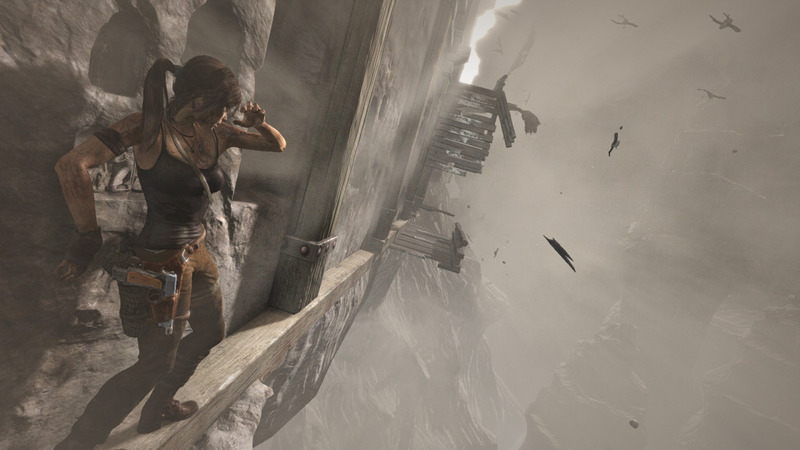 Tomb Raider's is still all right, but you still have to look it up. As you can see in the above pic, the buttons transfer over nicely, although completely off from the DS4 version. So don't expect to just guess your way through it. 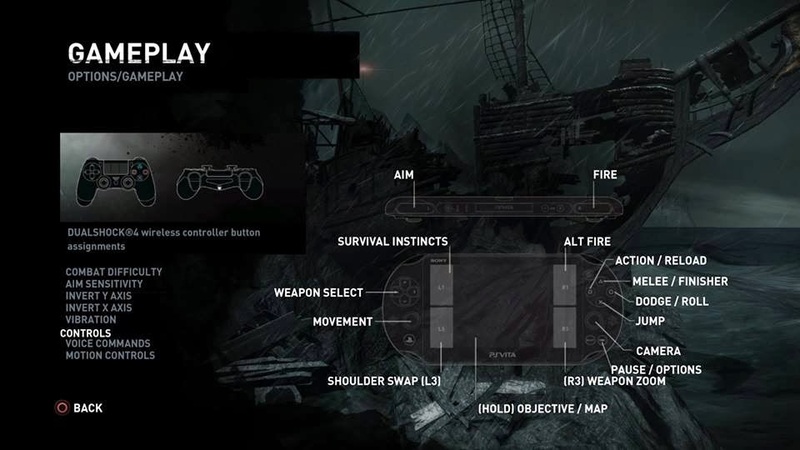 I looked at this mapping and thought that the "survival instinct" and other touch controls were on the back. I tried for a couple of minutes before finally realizing it was for the front touchscreen! Once you have that, you're good to go. That L2/R2 event I was talking about earlier? Onscreen it still says "L2/R2" but you have to hit the L and R shoulder buttons on the Vita. Just a little guesswork, but it makes sense, if not totally clear. I was REALLY hoping that the voice command function would work with the Vita's microphone. Sadly, nothing. The game still asked me to try it and so I was yelling at my Vita several times until I finally resolved myself to the fact that it wasn't going to work. I fired up a couple of MP matches on the Vita to see how it connected through Remote Play. Quick match got me into a game pretty quickly. Gameplay didn't suffer in speed or connection through the Vita... smooth and just as accurate as the PS4 play. Great! It is good to see that developers are all making their games a seamless move into Remote Play, and Tomb Raider is no different. + controls are easy to use, but not intuitive. You need to consult the control page to know how they translate. - I sure wish some of the PS4 control schemes translated over to the Vita, like voice controls or shaking the controller... That would've been a nice touch! Thanks to Square Enix for the review code! Comment below if you've tried the game out yet on the PS4. How was your experience with Remote Play?